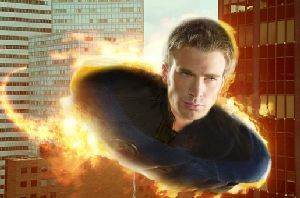 Cast: Ioan Gruffudd, Jessica Alba, Chris Evans, Michael Chiklis, Julian McMahon, Kerry Washington, Laurence Fishburne. Story: The superhero quartet face a new planetary threat. Another week, another sequel. According to the certificate thingy at the beginning, the movie's actually called "4: Rise of the Silver Surfer" - no Fantastic. I'd agree with that. Fantastic Four was always going to be one of the dafter superhero movies, a burden that it successfully counteracted with light-hearted humour that really hit the mark. This sequel doesn't go as far down that route, but scores more points with its spectacular special effects - so it's a matter of personal preference. Chris Evans (who I feel obliged to point out every time I mention him, isn't the ginger TV goblin) is still the most charismatic of the bunch, but doesn't seem to be putting in quite as much effort as he did in the original or his recent dramatic turn in Sunshine. Jessica Alba is still hugely incongruous, looking as she does like a strange porcelain doll, with somewhat less acting flexibility, while Ioan Gruffudd's classical style is simultaneously commendable yet uncomfortably misplaced within the cartoony environment. According to friends who know more than I do, the story is pretty close to the original comic book series, i.e. it's pretty silly. If you start picking holes in it, you'll be there all day and your friends will stop returning your calls, so it's best to have a giggle and gawp at the effects. The London scenes are of specific interest to us limeys, with the London Eye coming in for some particularly entertaining abuse at the hands of the new shiny protagonist. The plot is a by-the-numbers affair, with the next step being telegraphed so loudly you almost have to wear earplugs, and the humour isn't really strong enough to bear the full weight of the movie on its own. 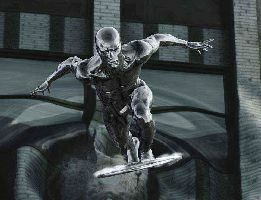 Fantastic Four: Rise of the Silver Surfer is a typical sequel. Top marks for effects, must try harder with the rest. I still enjoyed it, I just found myself at the end of the movie with a bit of an "is-that-it-then" feeling. To enjoy this film you should: expect a rather uninspired sequel. Fantastic Four: Rise of the Silver Surfer was released in the UK on 15th June 2007.